For the last week, many visitors to the blog have come via the keywords "Sylvia Plath's last book of poetry". In order to help you out with this, here is a summary of Sylvia Plath's "last book of poetry". The Colossus: This was Sylvia Plath's first published book of poetry. It was also the last book of poetry published in her lifetime. Ariel: this was the last book of poetry Sylvia Plath prepared for publication before her death. It was also the last book of poetry published under her name in the 1960s. Winter Trees: This collection was the last book of poetry published - not including limited editions - in the 1970s. The Collected Poems was, for four years, the last book of Sylvia Plath's poetry published until the Selected Poems was published in England in 1985 and in the US in 1998. Ariel: The Restored Edition, published in 2004, is the last book of poetry by Sylvia Plath prepared to be published. The Collected Poems was re-issued in 2008 by Harper Perenniel in the US, making this the last book of poetry published by Sylvia Plath. Sylvia Plath (poems selected by Ted Hughes) was re-issued on May 7, 2009, by Faber in England, making this the last book of poetry published by Sylvia Plath. I consider both Ariel and Ariel: The Restored Edition to be so good that almost no poetry after it counts at all. Making it the last book of poetry. The following post was submitted to Sylvia Plath Info Blog from Jim Long. I've just been reading the recently-published Words on Air: the complete correspondence between Elizabeth Bishop and Robert Lowell (Farrar, Straus & Giroux, 2008). I thought perhaps readers of this blog might be interested in a couple of comments between them on Plath, and on Richard Wilbur’s poem “Cottage Street, 1953”, in which he describes an early encounter with Sylvia and her mother, shortly after Sylvia’s breakdown and suicide attempt. This is interesting as being a spontaneous response that comes about 2-and-a-half years before he wrote the formal essay for the New York Review of Books that became the foreword to the American edition of Ariel. This exchange surprises me quite a lot, because it seems to me that both of these fine poets misconstrue the tone and point of Wilbur's poem entirely. If the irony is directed "against" anyone it is indeed against Wilbur himself. In the poem, he sets up a very formal kind of situation, the semi-ritual of the tea ceremony, the composure of the poet and "Mrs. Ward", who is Wilbur's mother-in-law, the formalities of introduction, set against the intensity of the "frightened Mrs. Plath" and her "immensely drowned" daughter -- the structural formality of the poem itself, the rigid rhyme scheme that attempts to contain and control the powerful emotions that run under the surface -- the gentility of the setting and the poet's own "impotence to bless" set against the "immensity" and largeness of Sylvia's emotional "refusal" -- the slightness of the chatter by which they try to lift her spirits, to "recommend Life", despite the brooding darkness that hints at an approaching end. Herein lies the irony -- that in spite of being expected to fulfill the role of “the published poet in his happiness" he himself feels but a "stupid lifeguard" in the shallows, compared to this very young woman who has been so "immensely drowned" in her own emotional depths. I see here a real sympathy on the poet's part (allowing that the speaker’s perspective is one of hindsight) for this young woman, who renders the poet, with his large public persona, so impotent, and "half-ashamed" of his inability to offer her any help at all. So, while the poem might legitimately be critiqued as somewhat mannered and laborious, it puzzles me greatly that Bishop and Lowell seem so oddly dense about the import of the poem, seeing it as "unfeeling" and lacking in irony. It suggests to me that there is some personal animus behind their criticism of Wilbur’s poem, which, curiously, Lowell himself hints at with his mention of “his rivalry” and in the line about the "people ... who are his old friends and welcome being bitter on him." Anyway, a curious passage in these wonderful letters. Elizabeth Lund, of The Christian Science Monitor, favorably reviews the recent poetry collection by Freida Hughes, Stonepicker & The Book of Mirrors. The Book of Mirrors will be published in the UK this fall, on 10 October. The papers of poet Nathaniel Tarn are held at Stanford University in California. Tarn took notes based on conversations, experiences, and things heard with David Wevill and Assia Wevill which involved the beginning of the affair between Assia and Ted Hughes in July 1962, the demise of the Plath-Hughes marriage, Plath's suicide, and beyond. Certain bits were quoted by Diane Middlebrook in Her Husband: Sylvia Plath and Ted Hughes-a marriage and by Eilat Negev and Yedhuda Koren in their 2006 biography of Assia Wevill, A Lover of Unreason. Tarn's handwriting is not easy to read, but it is a fascinating look at what was going on at the time. Wevill, David, and Wevill, Assia. DW: 5 als, 11 tls, 1 handwritten postcard; 26 pages & 12 pp. of photocopied poems & several poems in cuttings, 1958-86;AW: 6 als, 8 tls, 1 handwritten postcard; 22 pages; plus 23 ms pp. of NT notes concerning the Sylvia Plath & Assia Wevill (& child of Ted Hughes) suicides, unpublished, plus photos & mementos, 1958-69. I'd like to call your attention to a new page on A celebration, this is, my website for Sylvia Plath. The new page is a thumbnail gallery of periodical covers which published Plath's poems, stories, etc. As I find new images they will be added. Enjoy! Many people are to be thanked for their contributions to this page. You know who you are: with deep thanks. To introduce this page, I'm publishing here the cover of My Weekly. It was in this issue that Plath's short story "The Perfect Place" appeared on 28 October 1961. Drafted in late 1960 under the title of "The Lucky Stone", this story went unacknowledged for more than 40 years. To read more on its discovery - with the aide of Irralie Doel and Lena Friesen, see my essay in Plath Profiles. See here also the first page of the story. The following review of the BBC Four's recent A Poet's Guide to Britain: Sylvia Plath, which looked at Plath's poem "Wuthering Heights" is by Sheila Hamilton (aka "panther" as a commenter on this blog). I would like to thank her for taking the time to write these thoughtful, insightful comments about the program. This programme was the second in a series of six, all scheduled for showing on BBC4 on Monday evenings, and each presented by the young British poet and novelist Owen Sheers. The title of the whole series is A POET'S GUIDE TO BRITAIN and in it, Sheers has sought to examine not so much the lives of six landscape poets but rather, the lives of six poems, each of which explores a different British landscape. In this second programme, he looked at Sylvia Plath's poem "Wuthering Heights", written in 1961 and first published in book-form in CROSSING THE WATER (1971). The life of a poem, then, rather than a heavy focus on the life of its writer. This in itself feels very refreshing. Early in the programme, Sheers gives us the basic biographical details, and we get to see some photographs of Plath: as a child, at various social events, on her wedding day. Kudos to Sheers for mentioning her mental health problems, briefly, perhaps twice in the course of the entire 30 minutes ! Then he cracks onto the programme's central subject: the poem "Wuthering Heights", inspired by Plath's visits up to Yorkshire to visit her in-laws and, specifically, by her walk up to Top Withens, the ruinous farmhouse up on the moors outside Haworth and popularly considered to be Emily Bronte's model for Wuthering Heights in her only novel. Plath went to Yorkshire first in 1956, shortly after her marriage to Ted Hughes, and wrote OTHER Yorkshire poems responding to that wild, sometimes energizing, sometimes bleak landscape. Sheers examines two of these poems, "Hardcastle Crags" (originally entitled "Nocturne") and "The Great Carbuncle" in some detail, showing us how their tone-powerful, strange, unsettling- and some of their images feed later into "Wuthering Heights." I will say that at no point did this programme feel like a dry, academic exposition of a poem. Sheers is seen walking through the village of Heptonstall, where Hughes' s parents lived, walking on its dark cobbles, looking at its dark millstone grit cottages, wandering through its graveyard which, incidentally, inspired another Plath poem, "November Graveyard.") We see him slogging across damp and sometimes misty moorland as if in pursuit of the poem. Wild though this landscape is to most British people, he points out how much more alien it must have seemed to an American, especially one like Plath who was also contending with a dramatic and threatening INNER landscape. Cut for a while, then, to Cambridge, completely different: civilization, one may say, in contrast to Yorkshire's wildness. There's a quote at this point from one of Plath's interviews in which she says "I had always idolized England. . ." She came here for the literary associations and, more mundanely, on a Fulbright scholarship, to study English at Newnham College. The Newnham undergraduates-all women, it's still an all-female college- whom Sheers meets all come over as realistic and un-neurotic about Plath. They know about the life, and the suicide, but see her primarily as a POET, gifted no doubt but also hardworking and very ambitious, rather like themselves. Sheers comes over in this interview and with others as a sympathetic listener with a refreshing absence of agenda. He doesn't want CONFIRMATION of views already arrived-at; he really does want to form his own view of Plath, and of her poem. And so back to Yorkshire: more moorland, more rain, more fog. As the fog seeps into Sheers' bones, so we feel it seeping into ours. 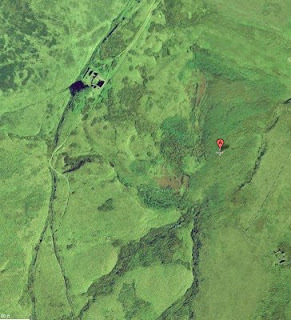 He visits Hardcastle Crags, a wooded valley that is close to Heptonstall, and then heaves over the moor to a pub at Widdop, a much more isolated community, and listens into the telling of some local ghost stories. Storytelling, and especially the telling of ghostly tales, is still very much part of the local culture. This ghostliness, he suggests, fed into "The Great Carbuncle" and then, finally, into "Wuthering Heights" itself. Thus, to the element of landscape very present in the poem, and to the element of menace (which is partly a reflection of Plath's inner struggle, her mindscape), is added a THIRD element: otherworldliness, the presence (covert) of other lives, the life of Emily Bronte, the lives of Catherine Earnshaw and Heathcliff, passionate, in some ways tormented, and very much influenced by their physical surroundings: the wind, the rain, the dark stones. After these necessary preambles-Cambridge, Heptonstall, Haworth-and comments from other poets, and the undergraduates at Newnham, and the listening-into of the ghost stories, we finally arrive with Sheers at Top Withens. By the way, I think it was a good decision on the programme-makers' part to film all this in the winter, as Sheers gets to touch the broken walls of Withens, and see the odd sheep, BY HIMSELF; in summer, he'd have been competing with at least a small crowd of hikers and Bronte enthusiasts with their cameras and guidebooks. (I don't want to criticize them-I too am a Bronte enthusiast !-but they do inevitably alter the experience.) The poem that has come up in bits and pieces throughout the programme, sometimes spoken, sometimes superimposed on the screen, comes up again. (Though never in its entirety. I'm not sure whether this is to tantalize the viewer into actually reading the poem-not a bad idea -or whether it's due to some copyright issue.) We hear Jo Shapcott again as she reflects on how the poem is dark but also witty, the sheep being sinister but also silly, like grandmothers in wigs. And Sheers concludes that it is in "Wuthering Heights" that Plath finally stops being intimidated by England's literary heritage and lays her very own claim to it. She refers to Bronte via the poem's title but the poem itself, the experience of the moors, is very much hers. "The grasses and her state of mind" become one. So, to sum up. This was a poetry programme that honoured the poet without being hagiographic or gossipy. It did not offer soft-focus or cliched visuals, as some other poetry programmes tend to do. Sheers and the programme-makers focussed rigorously on the poem. The imput from other people was interesting and relevant except, it must be said, Aurelia Plath's remarks (made in the Seventies, I believe) about her daughter being "very feminine" and how her success provoked jealousy in various boyfriends. These two statements might well be true, but I don't see how they help us to understand "Wuthering Heights." For a few moments, I felt disorientated, as if I'd stumbled into a completely different programme ! The programme's achievements? I am now re-reading all of Plath's Yorkshire poems; she wrote half a dozen, "Wuthering Heights" being the last. It's got me thinking more about various ways a poet might handle landscape. In the next programme in the series, Owen Sheers will be tackling "Hamnavoe" by the Orkney writer George Mackay Brown (1921-1996). Mackay Brown was, in contrast to Plath, very much an insider, almost part of the Orcadian landscape himself. What do he and Plath have in common, apart from being poets? Passion. For those in the UK, you can watch the BBC Four's recent A Poet's Guide to Britain: Sylvia Plath, which featured her poem "Wuthering Heights" by clicking here. It is available only to those in the UK until 7:59pm Monday 15th June 2009. Enjoy, over and over again. Thanks to Plinius for the link and Mapper.ACME for the image. For those who are collecting Sylvia Plath, Faber's special 80th Anniversary editions of Sylvia Plath's The Bell Jar and Selected Poems are now available through Faber's website, or places like Amazon.co.uk. And for those with access to BBC Four, don't forget that Sylvia Plath's "Wuthering Weights" will aire at 8.30 pm tonight. Look for a review here by a watcher sometime later this week! On Monday, 11 May 2009, at 8.30 PM, tune in the BBC Four for "Wuthering Heights" by Sylvia Plath, the second episode in the Poet's Guide to Britain, presented by Owen Sheers. "Of course this book could not exist without the permission given me by Ted and Olwyn Hughes, who have allowed me to publish sections from my daughter's correspondence and have given me the copyright for the selections from her letters." "It is my belief that the last blow may well have been the immediate penetration of her pseudonym 'Victoria Lucas'. She now realized that the fused, caricaturized [sic.] figures in The Bell Jar which bore recognizable idiosyncrasies, were going to be identified. Those who had sacrificed for her, served and lover her were to be hurt and would consider themselves betrayed." These comments by Aurelia Plath are interesting, especially compared to the text that replaced them. There is a thickly whited-out bit on page 407 of the proof. I think the comments were handwritten. Throughout the copy I looked at, I saw many other insertions: mostly ellipses, one handwritten date of a letter, etc. From what I could tell, this bound proof was photocopied from an earlier marked up galley proof. If you're interested in owning a Letters Home uncorrected proof copy, click here: there are two for sale. I do not know how common are "corrected" uncorrected proofs. In the copies I've seen in libraries, book stores, and at book fairs, they are mostly clean and truly uncorrected - appearing almost exactly as the first edition which it precedes. Indiana Univeristy at Bloomington holds the manuscript for Letters Home as well as most (maybe all?) of the original letters from Plath to her family. This spring, on BBC Four, poet and author Owen Sheers explores six great works of poetry set in the British landscape. The poems by William Wordsworth, Matthew Arnold, Lynette Roberts, Sylvia Plath, Louis MacNeice and George Mackay Brown explore a sense of place and identity across Britain and open doors to captivating stories about the poems, the places and the lives of the poets themselves. Wordworth's "Upon Westminster Bridge" will air on 4 May at 20:30. Plath's "Wuthering Heights" is representing the lovely Yorkshire region and will air on 11 May at 8.30 PM (30 mins). It will re-air on 12 May at 2.15 am so that the surgeons can watch, too. An early inspiration to Plath, Matthew Arnold's "Dover Beach" is another poem included in the series. Here is a blurb on Plath's program: "Poet and author Owen Sheers explores six great works of poetry set in the British landscape. He looks at Sylvia Plath's Wuthering Heights, part of a rich seam of landscape poetry she wrote about the Yorkshire moors. Sheers visits the dramatic country around Heptonstall where the newly-married Plath came to meet her in-laws, a world of gothic architecture and fog-soaked landscapes, where locals have a passion for ghost stories that connect with tales told in the kitchen of the Bronte parsonage." More information will be posted when it's available. It appears as though a companion book will be released later on this year in October. More info on that when it's available, too.